This "riveting" (Leslie Felperin, Variety) documentary focuses on a popular Russian youth organization with direct ties to the Kremlin: Nashi. Officially committed to advancing "anti-fascist and anti-oligarchic-capitalist" ideals, Nashi members are often found promoting the country's main political party - United Russia - and measures sponsored by Prime Minister Vladimir Putin. New York, NY - January 17, 2012 - Kino Lorber is proud to announce the theatrical release of Putin's Kiss (2011), a film by Lise Birk Pedersen. 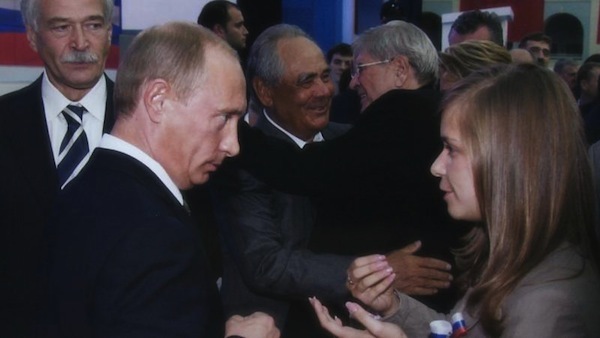 Set for a North American premiere at the upcoming Sundance Film Festival, in the World Cinema Documentary competition category, Putin's Kiss opens at New York's Cinema Village on February 17, 2012. National dates will follow, before a home video release later this year. Through their street protests and media reach, Nashi has become a powerful presence in many aspects of Russian life. Despite opposition from famed intellectuals, the group continues to attract an increasing number of young Russians, making Nashi one of the country's most powerful indoctrination forces. In one of their annual summer camps, Vasily Yakemenko, the group's creator and leader, told a crowd of eager teenagers: "... in exactly eight days, you will leave as a different person." 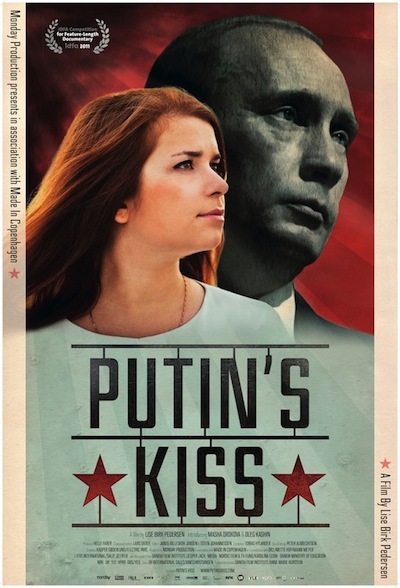 Specifically, Putin's Kiss traces the evolution of Masha Drokova, a middle-class, 19-year-old girl who joined the group at the age of 16 and quickly became a spokesperson for the organization. Her direct access to Yakemenko, now the country's Minister of Youth, gave Masha her own TV show and many financial perks, including the chance to meet (and kiss) Mr. Putin himself. As a Nashi leader and spokesperson, Masha has to defend a series of controversial measures on national television (e.g. condoning the burning of a book featuring homosexual characters). But through this process, Drokova is also exposed to several key figures of the opposition movement, including the journalist/blogger Oleg Kashin - and she begins to debate them on a regular basis. Although Oleg and Kasha passionately disagree on several topics, they grew to respect and like each other. 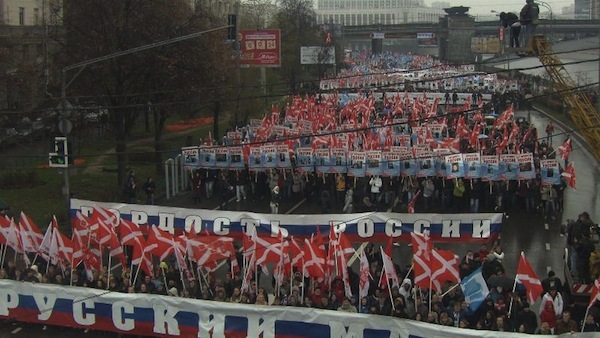 A Nashi Demonstration Against The Enemies Of Russia. Influenced by information acquired in her contact with the opposition, Masha's bid for re-election (within Nashi) is measured and conciliatory, and she loses her position to a more incendiary and nationalistic member. Furthermore, when "unknown perpetrators" attack Oleg Kashin and put him on the brink of death, Masha joins a protest demanding enhanced protection for members of the opposition, further alienating herself from Mr. Yakemenko. But can Masha leave Nashi and remain safe? Together, Oleg and Masha form an iconic portrait of the intellectual, ethical and socio-economical crossroads faced by young people in a post-soviet, capitalist Russia. Their fascinating and evolving perspectives on the realities of Russian political life are a testament to their generations' commitments to a better future - and a proof that despite significant pain and sacrifice, Russians are once again, engaged in writing their own history. Journalist Oleg Kashin will also be available for email and in-person interviews in early February. Oleg Kashin and Lise Birk Pedersen are scheduled to attend the film's New York opening on February 17. With a library of 700 titles, Kino Lorber Inc. has been a leader in independent distribution for over 30 years and releases over 20 films per year theatrically under its Kino Lorber, Kino Classics and Alive Mind Cinema banners. In addition, the Company brings over 60 titles each year to the home entertainment market with DVD and Blu-ray releases and digital distribution on over 15 internet platforms and VOD services.